When Patrick Ta asked me who some of my favorite makeup artists were while meeting at the La Mer counter in Bloomingdale's for a press event, I felt silly saying "Well, you," as if I were just trying to flatter him or because he was standing right in front of me. But it couldn't be a truer statement. Ta's technique is second to none—he's somehow able to lift his clients' faces (which I attribute to a super-sharp angled eye shadow line) while somehow creating an otherworldly airbrushed-luminescent hybrid look on the complexion. Anytime I see Gigi, Shay, or Olivia Munn post a sick makeup shot, I can almost tell right away that it was Ta's handiwork. That being said, I was a bit starstruck when I got the opportunity to have him do my makeup. In the spirit of summer being right around the corner, we talked about doing a look that was dewy, light, and fresh, and in typical Ta fashion, he gave me a ton of pointers for how to execute it. Read on for Ta's best beauty tips. 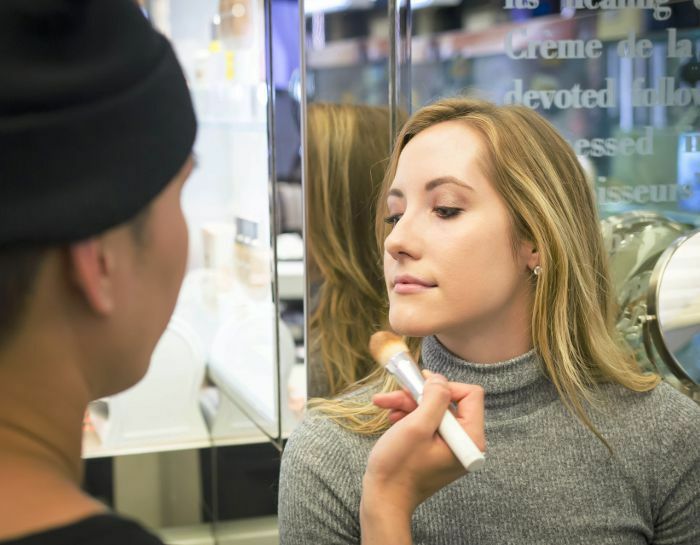 "I honestly think that it makes such a difference when your skin is great already before you apply makeup," Ta says. "So, apply a face mask, rinse it off, and apply a great moisturizer. I try to find one that's not too heavy for before you go to an event because you don't want it to look too oily. My favorite is La Mer The Moisturizing Gel Cream ($310) because it's super, super, super lightweight." Ta applied the moisturizer to my face by first warming it up on the back of his hand, and then, using a brush, he worked in a V-shape along my under-eye area, down around my jawline, and finally into my cheek. He repeated this on my other cheek, and then he finished up along the forehead, nose, and chin. Ta's big on prepping the under-eye area before makeup, and he especially likes to place gel eye patches in the freezer (we like Elemis's variation) before applying to tighten the skin and reduce dark circles. We didn't have a freezer handy at Bloomies, but he tapped The Eye Balm Intense from my tear ducts to my outer eyes with his middle finger for supple hydration pre-concealer. "I don't use too much primer. I apply so much skincare, like moisturizer and everything—it's just too many things on the face," Ta says. If his Instagram feed is any indication of what not using primer can do, then we're on board. Don't rely on just one bottle to get the job done. For me, Ta mixed two shades (one pump each), then warmed them on the back of his hand before applying with a brush. His technique was gentle, short strokes and a bit of stippling under the eye and along the side of the nose. This result was a well-blended custom hue that made its way seamlessly into my neck. If you prefer an even more natural look (though my look was very second-skin), Ta recommends mixing your foundation with a bit of oil or moisturizer to dilute the formula. Ta applied concealer that was two shades lighter than my foundation underneath my eyes, on the bridge of the nose, and on the top of the forehead. Then, he dusted a bit of loose setting powder on just the center of my face to leave the perimeter more natural and dewy-looking. Ta dusted bronzer with a big fluffy brush along the top of my forehead and temples (really concentrating on this area), then worked along the cheekbones and underneath the chin. He then applied Tom Ford blush ($60) by lighting pressing the brush into my cheeks in circular motions so as not to "disturb the foundation." If applying something wet to your makeup after you've just done a full face sounds horrifying (it did to me once, too), Ta actually swears by it. "Finish off with a little mist to really melt the product into the skin. Then it will actually look like skin when you're ready to go out and not like you're wearing too much." We just focused on my complexion that day (I came with my brows and eyes done, and Ta finished everything off with neutral pink-peach lip color), but the final result was almost as great as his celeb roster (all I was missing were those shiny Hollywood genes). Which celebrity makeup artists do you consistently follow? Please share with us below!